George and Sam Barris started with an highly unusual car for a full Custom Restyling job, yet they were still able to create an stunning Custom out of Tommy Thornburghs 1947 Studebaker. Back in the 1940’s and early 1950’s it was most common to custom restyle Ford’ Chevy’, Buick, Mercury’s and an occasional Cadillac, but you rarely saw a Custom Restyled Studebaker. I’m not quite sure why not, the Studebaker’s always had a very distinctive styling, with wonderful tapered fenders, and unique body styles. And the car in this article sure shows that with the right planning and restyling the Studebaker could be turned into a very beautiful Custom Car. 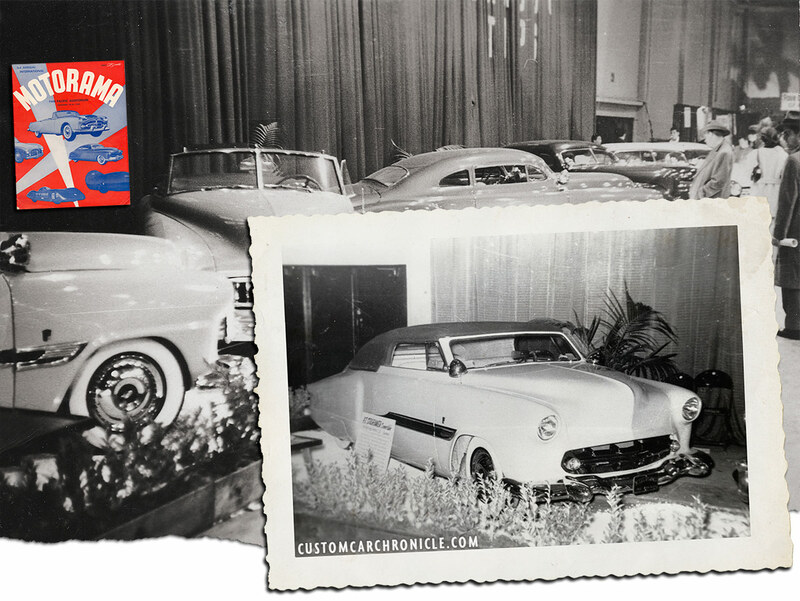 For Tommy Thornburgh there was no question about what kind of car he had to start with for his Custom Dream. His family owned a Studebaker dealership in Huntington Park, Ca, so the Studebaker was really the only choice for him. 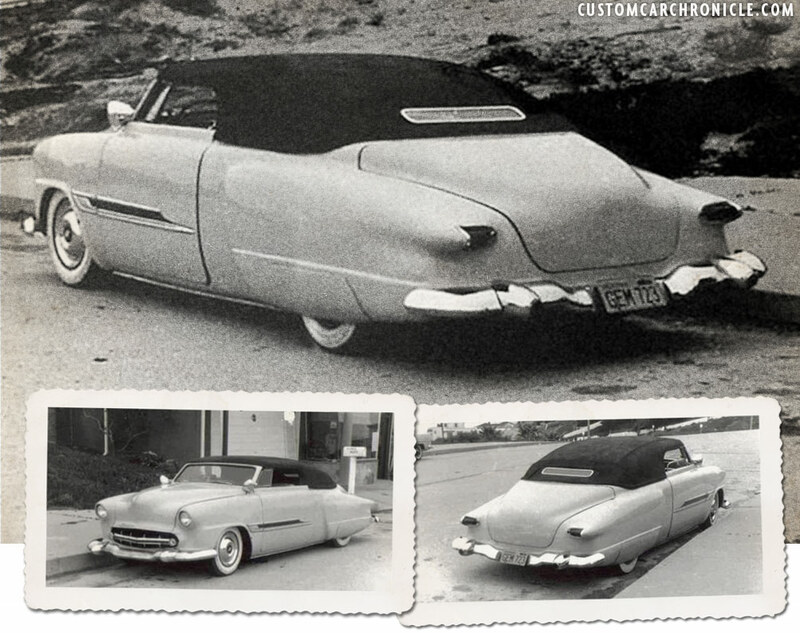 I guess at the time (late 1951-early 1952) it must have been a kind of a challenge for the Barris Shop to create a good looking Custom out of the stubby looking, relatively small convertible. 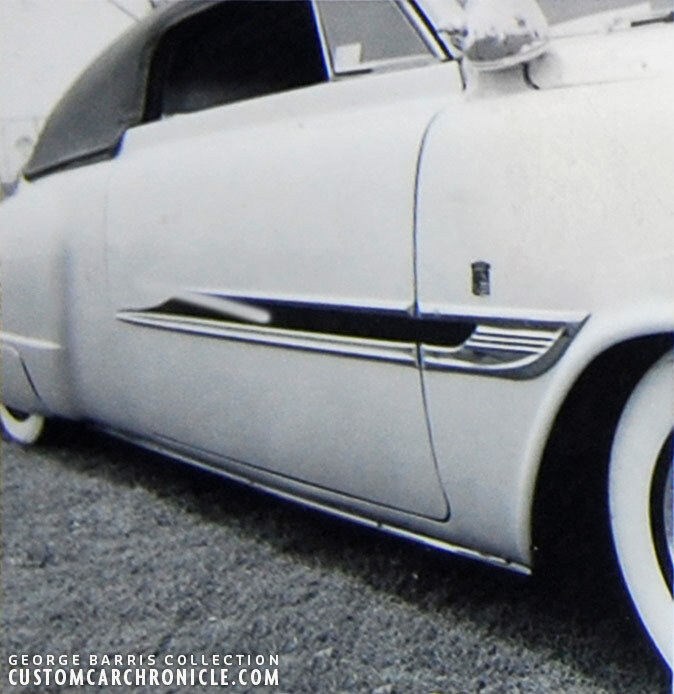 The end result shows why the Barris Kustom Shop was one of the nations leading Custom Shops. No matter what they had to start with, the end result was far more beautiful than what was brought into the shop, and so highly effective that the finished car made it into a great number spread out over couple of years. Stock 1947 Studebaker convertible. Notice how the rear fenders are several inches short of meeting the rest of the lower body edge. Barris fixed this on Tommy’s Custom. Also noticed the separation line at the rear of the front fender and the vent door on the front fender. Sadly we have not been able to find any in progress photos showing the heavy metal work needed to create Tommy’s stylish Studebaker. But we do have this photo showing an early, unfinished version in light primer. A lot of the heavy body work has already been performed, but the rear splash pan still needs to be added, and the trunk still needs to have the bottom lip shortened and corners rounded. 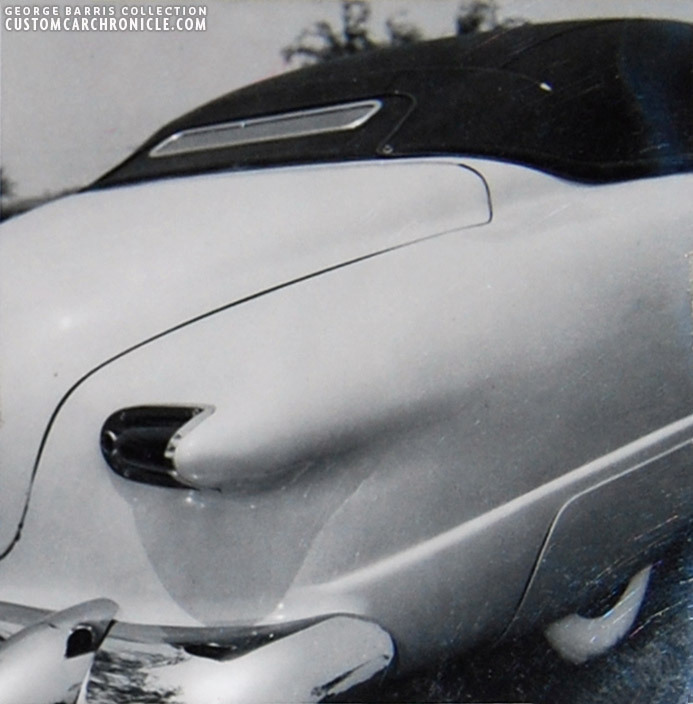 The rear fender extension was hand shaped and formed so that a set of ’52 Studebaker taillights would fit perfectly at the top of the fenders. The light units were canted 90 degrees so the top section would now face to the center of the trunk. The rear fenders were molded into the body and the bottom section of the rear fenders was extended downwards several inches to fit level with the bottom of the body. Hand made fender skirts were created and make the effect even more dramatic. The car in primer with most of the body work done was photographed with ’51 California plates with a ’52 year tag added. 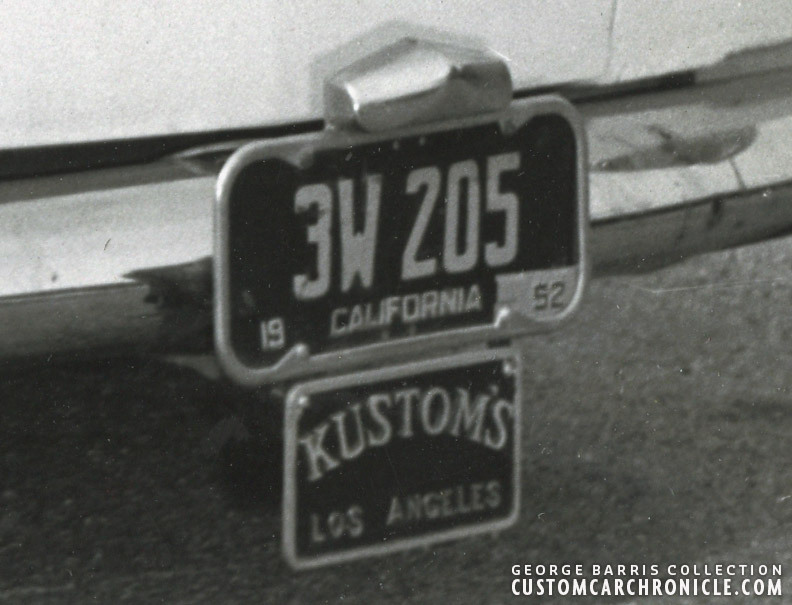 Tommy was a proud Kustoms Los Angeles club member and had created special brackets below the license plate to mount his KLA plaque. At the front the hood was completely shaved, and the front section was extended down into a new hand shaped lipped grille surround. An unique grille surround not seen on any other Barris custom before, or after. It looks very much like the Barris shop used part of an 1951-52 Chevy grille surround, de-chromed and molded into the bottom of the hood and the front fenders. It had that distinctive character line on the sides. (Thanks to Larry Pointer for pointing that out, I had been looking at that surround for a long time, knew I had seen it before, but could not place it.) The lip around the grille surround already added some extra length at the front, but the Barris crew wanted more. So they decided to extend the fenders, and build in headlight surrounds with slightly longer eyebrows, extending the fenders with 2,5 inches. The lights were frenched leaving a nice lip around the headlights. The front fenders were welded to the cowl unit, the vents on the side of the front fenders were welded shut and all smoothed cleaning of the front sides of the car considerably. All stock trim and handles were removed and the door bottom corners were rounded, front and rear. A set of electric push buttons and solenoids was installed to open the doors as well as the trunk. The windshield frame was chopped 4 inches according the period magazines. It might not have been an easy chop, especially getting the bend glass to fit the new windshield opening. George installed a set of his favorite Appleton Spotlights, wide white wall tires with ’52-53 Lincoln hubcaps and the car was primed in a light color primer. Tommy drove it like this for some time before the final restyling was performed. 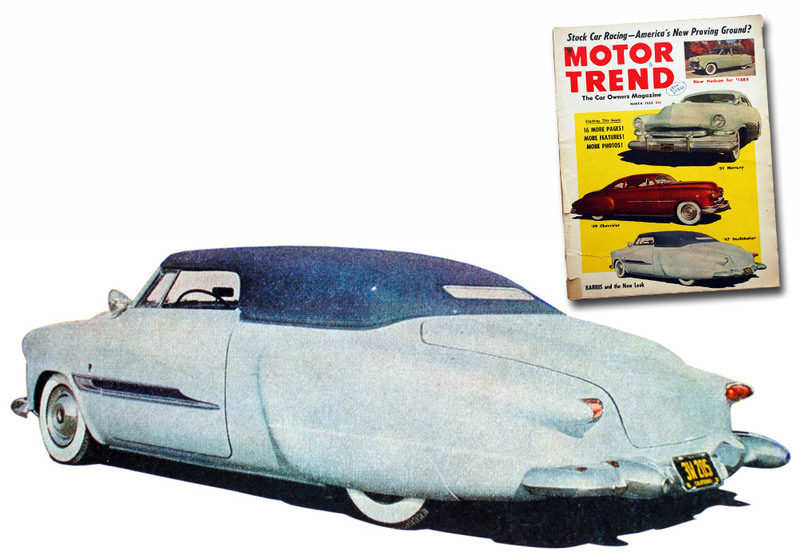 A photo of the car in light primer with the rear body work still to be done appeared in the 1952 published Trend Book No. 105 Restyle your car. It shows how the door corners are rounded. Notice how flat the front end looks without the ’52 Lincoln bumper added. 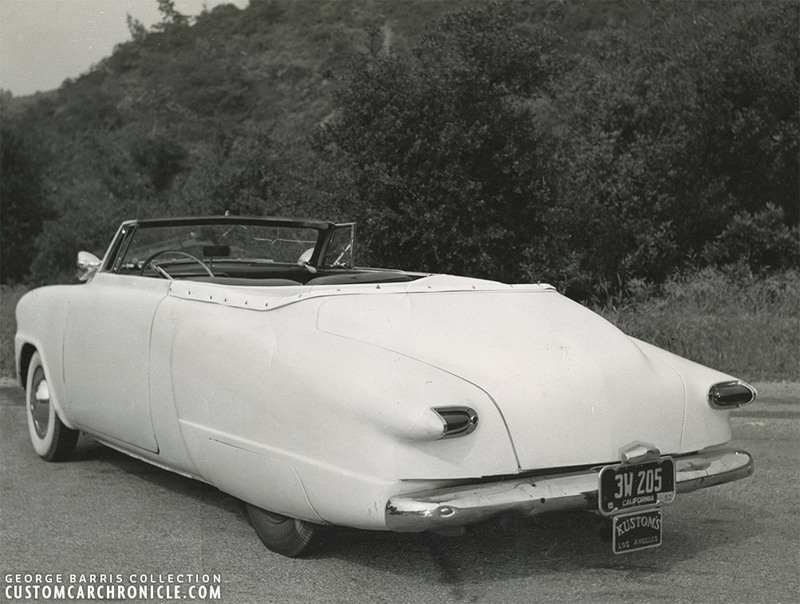 A photo of the unfinished primer version also appeared in the 1952 Petersen Motorama Show program. The show was held from November 10-16, 1952. And Tommy’s Studebaker was at the show, all finished. In the later part of 1952 Tommy took the car back to the Barris Shop to have the finished what they had started. The car looked already a thousand times better than how it looked from the factory, but now it was time for the finishing touches. The crew at Barris Kustoms added splash pans front and rear, they were welded to the body and molded in. At the rear the trunk lower edge was cut and welded to the splash pan, then the corners of the trunk were rounded. 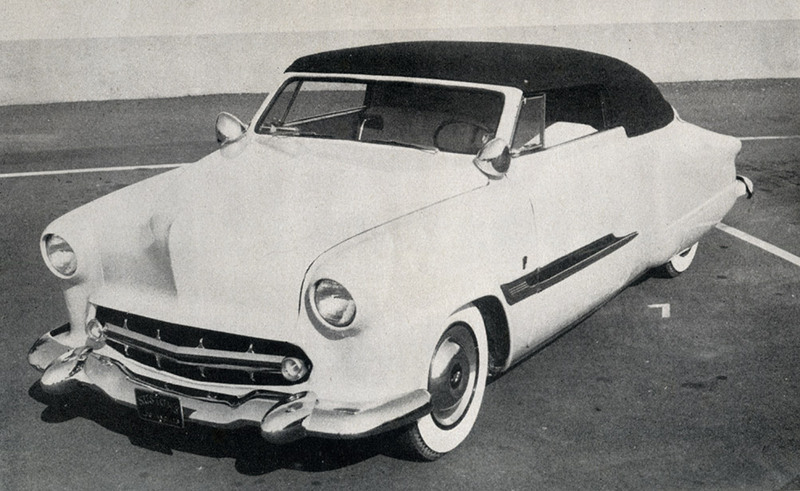 A ’52 Lincoln front bumper/grille was chosen to be the best bumper unit for the Studebaker. 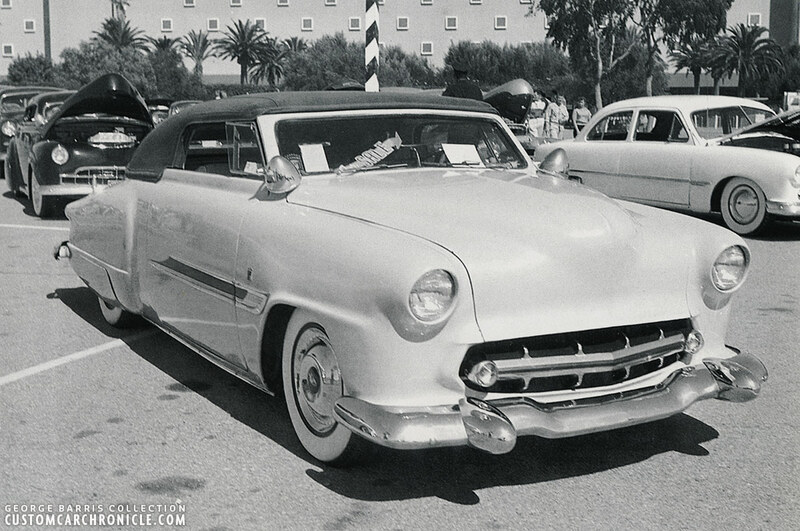 They would use the ’52 Lincoln front bumper both front and rear. The Lincoln bullet shaped guards were re-positioned on the bumper to suite the Studebaker better. At the rear the bullets were modified to accept the exhaust tips to protrude thru the tip of the bullets. The bumpers and molded splash pans worked amazingly for the Studebaker, adding the so much extra length to make it all flow so much better. 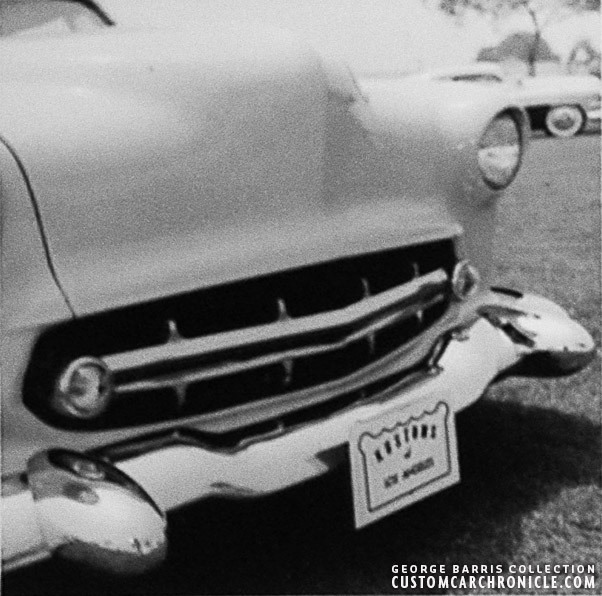 The Barris Kustoms Shop is known for their wonderful, and exclusive grille designs. Tommy’s Studebaker is a wonderful sample for this. The guys at Barris tarted with a two bar ’49 Lincoln grille. The center portion of both bars was removed and the ends welded together to match the v-shape of the hood-lip. The lower bar was then flipped 180 degrees so that the teeth on the bar would face down, creating a bar with teeth at the bottom and top. At the end of these two grille bars a teardrop shaped parking light unit was added, most likely from an late 40’s Henry J. The whole unit was send out to be chrome plated, then it was installed in a floating way, mounted from behind on rubber stubs, or springs. Beautiful higher point of view rear 3/4 photo shows the stylish lines on Tommy’s Studebaker. The way the rear fenders were extended, the ’52 Studebaker taillights were integrated and how the corners on the trunk were rounded, the splash pan was molded. And of coure the unique ice blue paint with dark blue Carson Top Shop created padded top. Colorized photo. The hubcaps are ’52-53 Lincoln units, and they fit the car absolutely perfect. perhaps even better as the then mostly used Cadillac Sombrero units. The guys at the Barris Shop really had everything right on Tommy’s Studebaker. Low angle 3/4 image was used in the 1954 Custom Cars Annual where Tommy’s Studebaker was featured with two photos, and minimal writing on a full spread. Marcia Campbell taught George Barris how to take good photos of the Custom Cars, one thing George learned was the importance of a good full profile side view. It gives the audience a really good feel how the car really looks. And it the case of Tommy’s Studebaker is extreme stylish. Notices how the bottom of the rear fenders are level with the bottom of the car… now check a factory stock ’47 Studebaker. Tommy posing with his Studebaker with open door which gives us a better look at the rounded door bottom corners. The large smooth body sides were spiced up with a modified side trim of a ’52 Pontiac. 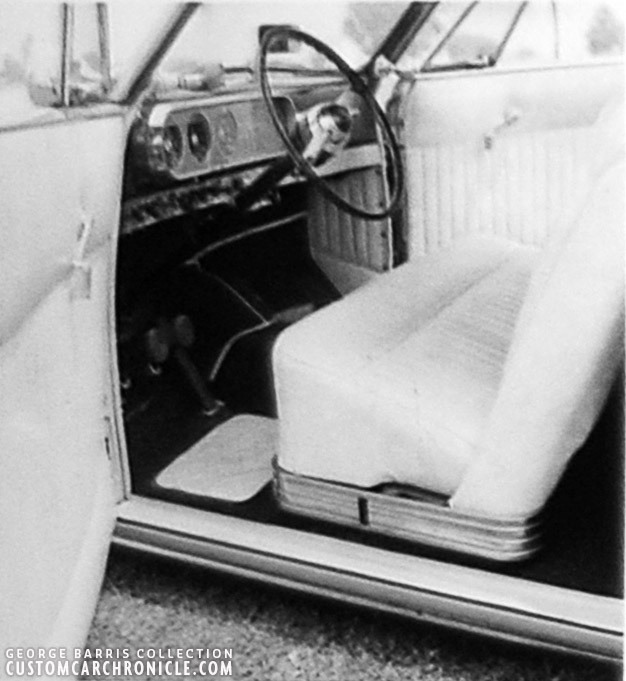 The top and front portion of the trim remained unchanged front stock, but the lower trim on the door was shortened. The car was then sanded smooth and painted in a beautiful ice blue. George wanted to use a light color so that the car would look a little bigger. The section in between the modified Pontiac side trim was painted a brilliant metallic dark blue. After that the car went to the Carson Top Shop for an unique Padded Top and full custom interior. The Carson Top Shop was known to use specially made jigs so they could create padded tops for the most common cars, off the car. This allowed the upholsterer to walk around and under the top much easier. 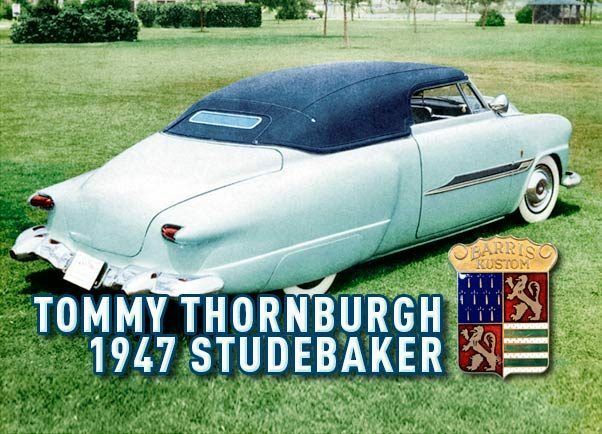 However Tommy’s ’47 Studebaker might have been the only Studebaker they ever made a padded top for, so more than likely this top was created on the car it self. George Barris wanted to have the top done in dark blue to work best with the ice blue paint and dark blue side trim insert. The shape of the top, the way it flows, the way the rear quarter windows are filled is just as perfect as it can be. 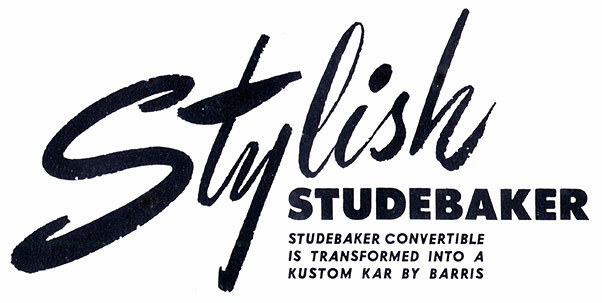 The shape of the Studebaker interior tub is totally unique, and it must have been a bit of a challenge for the Carson Top Shop employees to create this to. 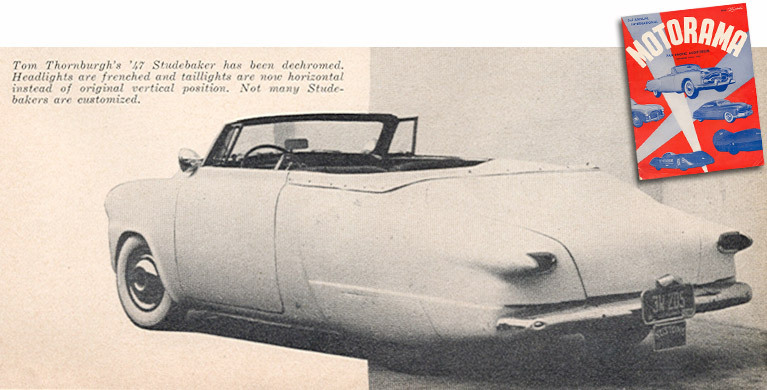 But the top they created enhances all the beautiful restyled shapes of the Studebaker so well. It has become one of my personal favorite Padded Tops. Barris used one 1949 Lincoln grille, which comes with two identical bars to create the unique Thornburg Studebaker grille. Each bar was cut in the center and welded in the right shape. Then the bottom bar was flipped upside down, The integrated parking lights are most likely Henry J units. The photos of Tommy’s Studebaker taken in a “park” were most likely shot the same day, and at the same location as this out door car show. In at least one of the photos we can see the Hirohata Merc parked in the background, and all Barris cars have the famous Paper Kustoms Los Angeles tag mounted front and rear. Tommy’s Studebaker is parked all the way on the right side of this photo. Close up on the canted 1952 Studebaker taillights. These light were mounded in hand formed pods/wind-splits, which helped extend the optical length of the car. The ’52 Lincoln front bumper used on the back is mounted on molded in splash pans. The rest of the interior was also completely done by the Carson Top Shop, using white leatherette they created a very stylish mostly all white interior, beautifully done rolled and pleated. The headliner is done in white and an a medium color with white piping. None of the period publications mention anything about the headliner, but my guess is that the second color was a light blue, or grayish blue to complement, or match the exterior paint. The carpet were done in dark blue with white piping and white leatherette mats. 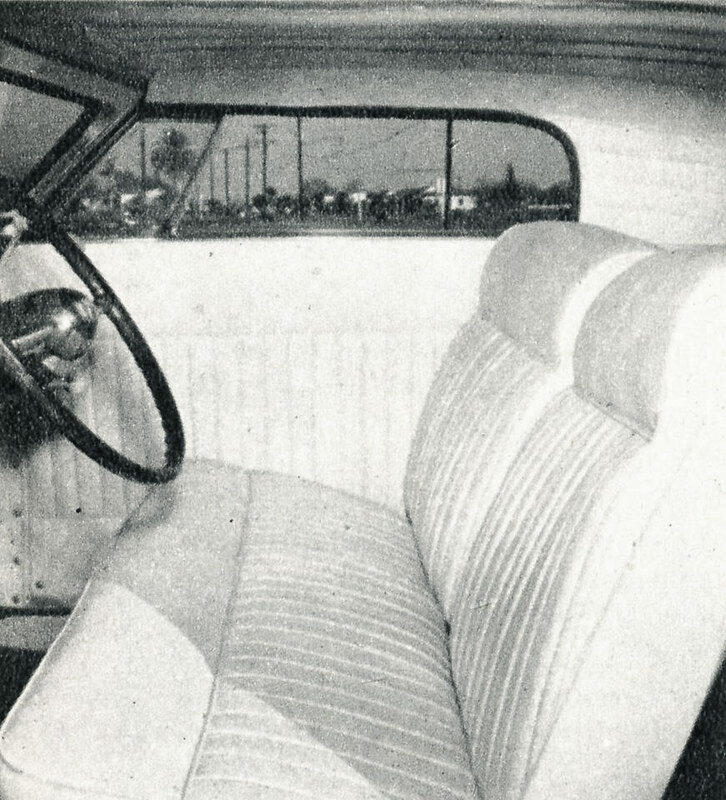 The Studebaker dash and steering wheel were left untouched. Another look at the interior shows the nicely upholstered seats and door panels. Barely visible in this photo but the center section of the headliner is a darker shade, perhaps light blue, to match the body? Notice how the rearward positioned vent windows give an instant speed effect to the car, even from the inside. Close up of the sides of Tommy’s Studebaker show how the front fenders were welded to the cowl, the vent windows are now welded shut and smoothed. The side trim is made from modified (shortened) 1952 Pontiac side trim. Taken from a photo test sheet, this nice front 3/4 low angle photo probably made it into a publication. A few more snapshots of the Thornburgh Studebaker. 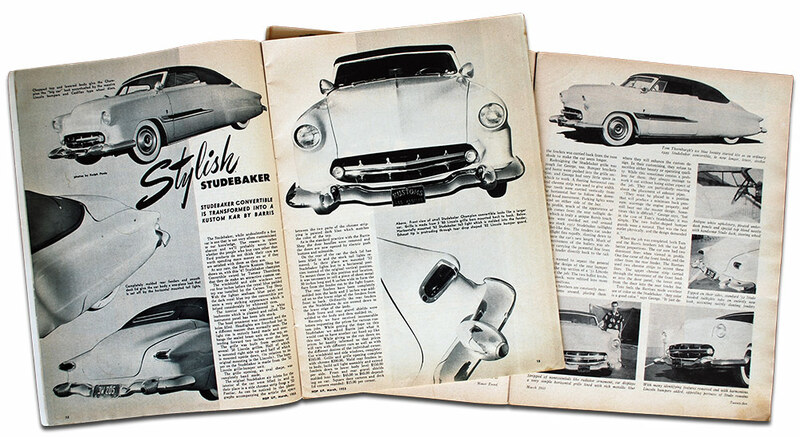 Because the Thornburgh Studebaker was such an unusual custom car, as well as a very stylish one, it made it into a lot of publications in the early to mid 1950’s. 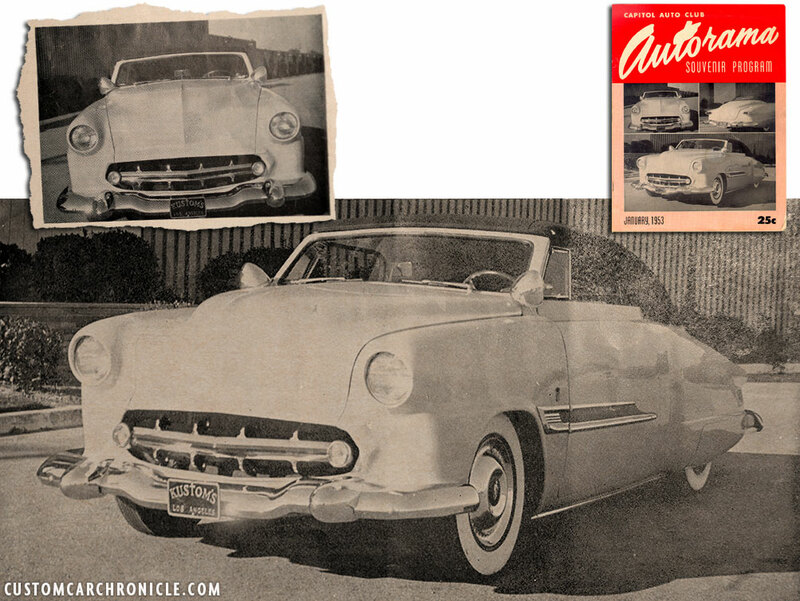 Here is a two page spread in the March 1953 issue of Hop Up Magazine on the left, and Tommy’s studebaker was part of a three Barris Custom Car feature in the March 1953 of Motor Trend magazine. 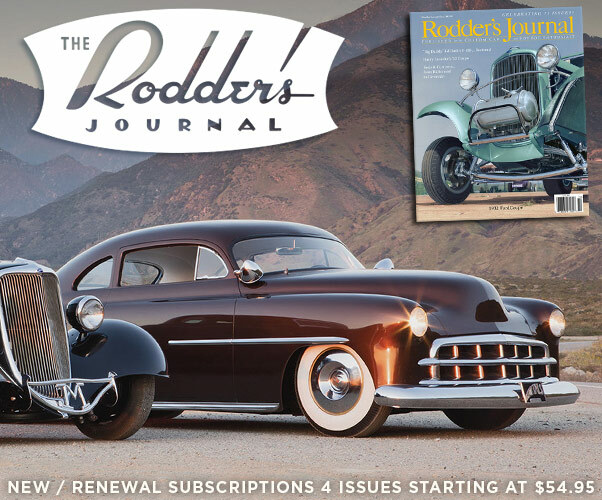 Tommy’s Studebaker was featured on a full page. Beautiful front 3/4 view. set free from its background was used in the March ’53 issue of Motor Trend Magazine. This angle shows the beautiful lines of the Barris Kustoms created Custom. The car is mistakenly dated as a ’49 Studebaker in the article. Two more images and photo captions from the Motor Trend article. The car was finished just in time for the prestigious Petersen Motorama show held from November 10-16, 1952. 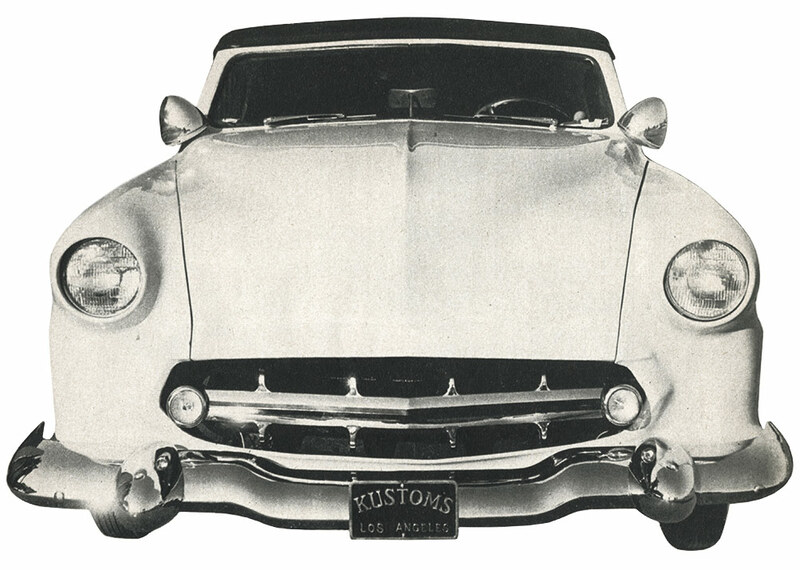 Tommy’s Studebaker was among the first Barris Shop created customs to get the brand new Barris Crest. It was mounted on the front fender, just above the side trim. The finished Studebaker must have been quite a sensation at the Motorama. 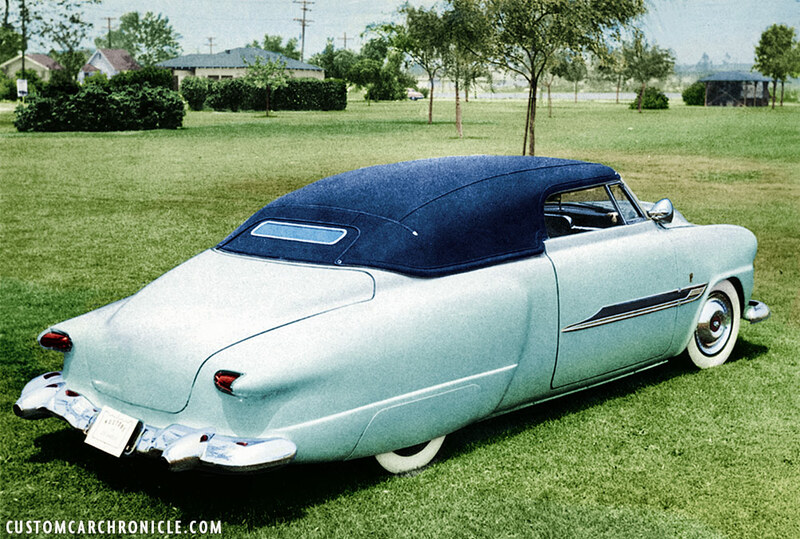 With its totally unique color, the blue padded top, and of course being based on the highly unusual Studebaker. Tommy’s Studebaker was featured in many magazines from 1953 and up. High point must have been the cover of the Sacramento Autorama Show Catalog in 1953, and of course in full color on the March 1953 issue of Motor Trend Magazine. 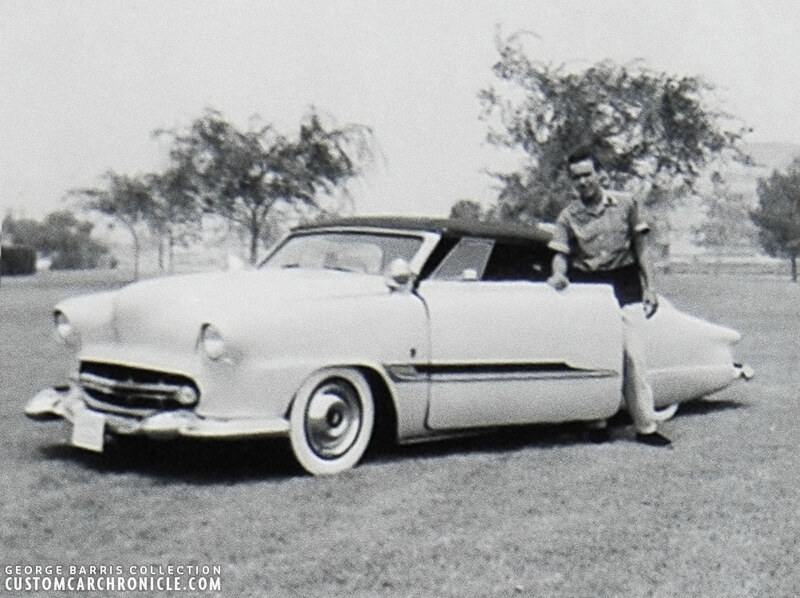 Tommy Thornburgh’s 1947 Studebaker convertible was one of the 6 special Barris Kustom Shop created cars that were displayed at the ’52 Motorama show at the Pan-Pacific Auditorium in Los Angeles. The big picture shows Tommy’s car all the way on the left side of the Barris ustoms wall display. The car was freshly finished, and this was possibly the first full show the brand new Barris crests had been added to the Barris Kustoms created cars. Tommy’s Studebaker was featured on the cover of the 1953 Sacramento Autorama Show Program. The pictures for the program were taken at the Compton Drive-in Theater, a popular photo location of George Barris. The March issue of Motor Trend magazine is one of the all time best covers. And mainly because it shows no less than three Milestone Barris Customs in color on the cover. This is – so far – the only real color photo I have ever seen on Tommy’s Studebaker (as well as Dan Landon’s Chevy). The rear 3/4 view is perhaps my own personal favorite view of Tommy’s Studebaker. Everything makes so much sense from this angle. Tommy was a member of the George Barris’s Kustom Los Angeles Car Club. 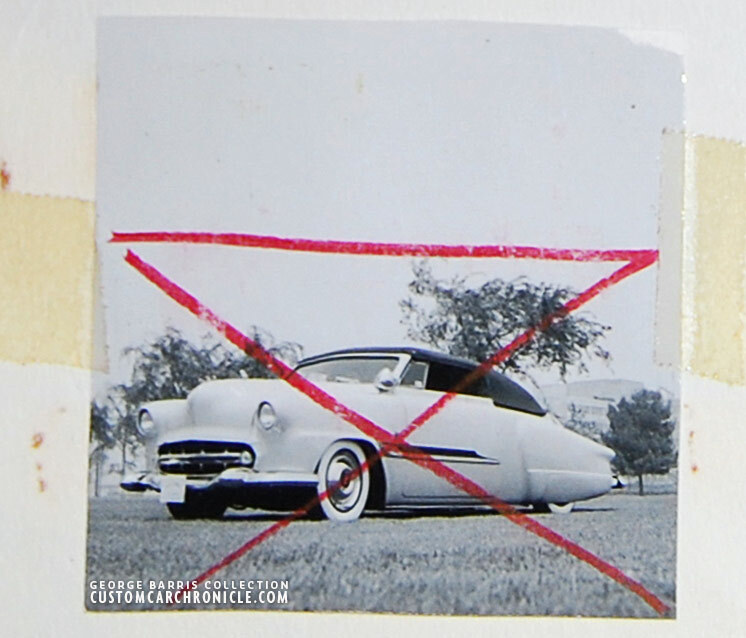 A club strictly for Barris Kustoms created cars. 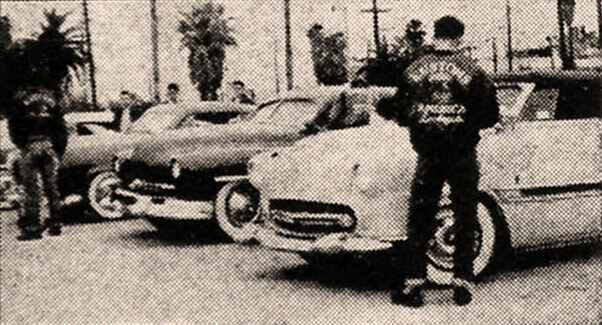 In one of the magazine ads for the later Kustoms of America George used this photo showing Tommy’s Studebaker parked next to Louis Bettancourt’s Merc, and the former Busterl Litton owned Panoramic Ford. Most likely that is Tommy showing of his Kustoms America Los Angeles jacket for the camera. Photo taken at the Thrifty drug store on Rodeo Rd and LA Brea in Los Angeles on May 14, 1954. The photo does not show much of the car, but it does show the really unique shape of the Carson Top Shop created Padded Top. This photo was taken at an outdoor car show held at the parking lot of the Hollywood Park, a famous horse racing track in Inglewood California. Around 1954-55. At the time Tommy tried to sell the car with a For Sale sign in the windshield. We know very little about Tommy and what happened with the car after he had enjoyed for a couple of years. Around 1954 Tommy had a For Sale sign in the windshield. The last photos we have been able to find of the car shows the car with 1956 California plates on the back, and no year tag, so those are most likely taken in 1956. The only thing we have heard about the car after that is that it went to Oregon around that time and that Donald Mohr, who lived in Central Point Oregon owned the car for some time (Thanks to Bruce Heather for the info). Later the car might have been painted maroon, or possibly candy red. But what became of it from there on, we have no idea. Donald Mohr, who lived in Central Point Oregon owned the car around 1956. 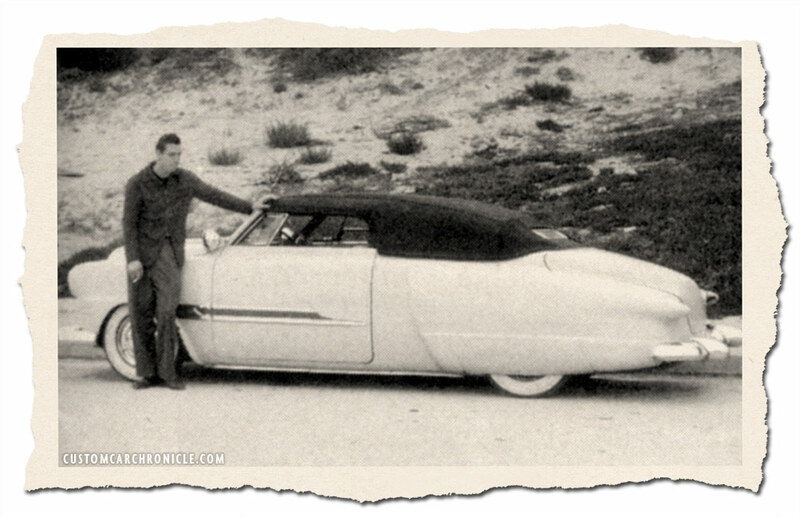 Here Donald is posing with his Barris Restyled ’47 Studebaker. Series of photos taken at the same, unknown, location in Oregon, as the one with Donald Mohr posting with the car above. The car now has a new (no added year tag) 1956 license plate. So the photos were probably taken around 1956. Hopefully the car is still around, hiding in a garage, or shed waiting for the right moment to the surface again. Tommy Thornburgh’s ’47 Studebaker is such an unique Custom, you would think that people would remember seeing it. Hopefully this extra attention on the Custom Car Chronicle will help get some more information about what happened with the Tommy Thornburgh ’47 Studebaker. 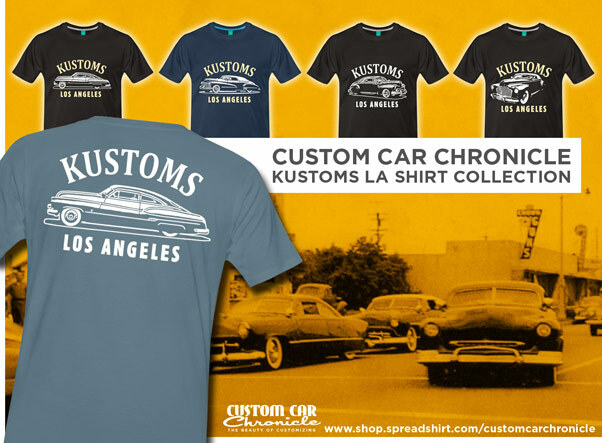 If any of our readers knows something more about it, please let us know and Email Rik here at the Custom Car Chronicle. Having spend a lot of time with Tommy’s Studebaker researching this article I wonder why we have not seen more of these Studebaker’s done up as full customs, back then, and especially now. They make absolutely beautiful Customs, perhaps with a bit more effort than your standard Ford or Mercur, and you have to be a little bit more creative. But then you have something very nice, and totally unique. 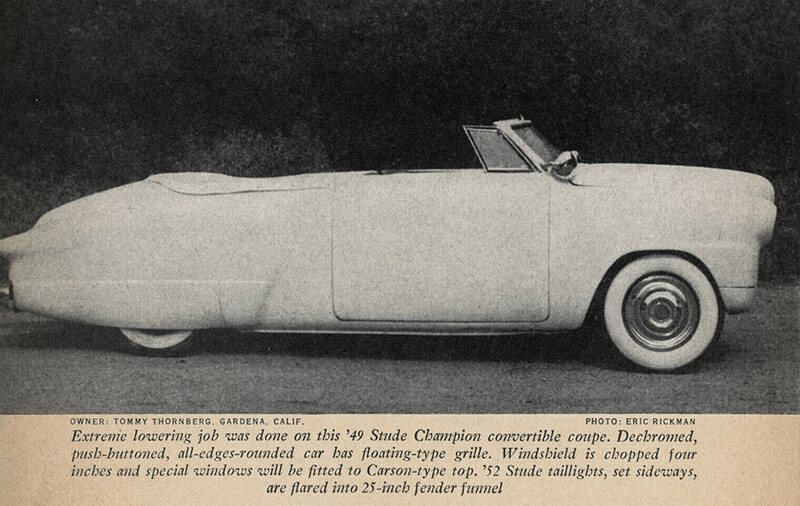 Or, perhaps it is time for somebody to recreate the Tommy Thornburgh ’47 Studebaker. And allow all the younger generations to see this stunning Barris Kustoms creation with their own eyes. Definitely a unique custom. The rear deck area with it’s downward slope almost gives the impression of a Aero sedan that has had it’s roof cut off and a Carson top added. And the tail light treatment is one of a kind. Great article that Rik, that as always, gives us more information. It would be Fantastic if this one reappeared. In studying the full frontal view, I was struck by the horizontal ridge at either end of the grille surround, as molded into the hood and fenders. I see a striking resemblance to the 51-52 Chevrolet chromed grille surround top piece. I’m wondering if Barris borrowed a pair of those Chevrolet pieces, one upside down for the lower surround. Just saying. Thanks for pointing that out Larry…. Thats it. I had been looking at that for a long time.. and I knew I had seen a similar shape before, but could not figure out that it was. I have added that to the story now. The front end is very Chevrolet-ish looking. Something old, something new; something borrowed, something blue. The old saw about the wedding dress comes to mind with the traditional custom car. As an awkward teenage Forrest Gump, those “little pages” at the Smoke Shop brought inspiration. Each month, to see what those California boys were able to do to bring grace to the awkward automobiles! Frankly, that Studebaker is a prime example. Borrowed parts and pieces. The clever adaptations became an monthly challenge to spot. My favorite teenage game. Fabrication. A whole new world of possibilities. Sculpting with sheet metal. Mesmerizing magic. And we devoured those “how-to” photo essays. The Thornburg Studebaker gives us the best of both, adaptation and fabrication. What a clinic in coherent styling, from bumper to bumper. Thanks so much, Rik, for taking us back to those basics. Long live the CCC. love the shape of the top but would rather have seen it in white. 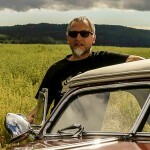 I’ve always loved Tommy’s Studebaker because of its uniqueness and successful restyling. They made a smaller, unpopular car fit right in with some heavy-hitting kustoms. The way the Carson top wraps around that rear catwalk above the trunk is just so bitchin!